Advantages: Excellent pictorial history; full colour images plus 141 b&w wartime photos, many new and unpublished; attractive colour profiles; excellent format for modellers; great value. 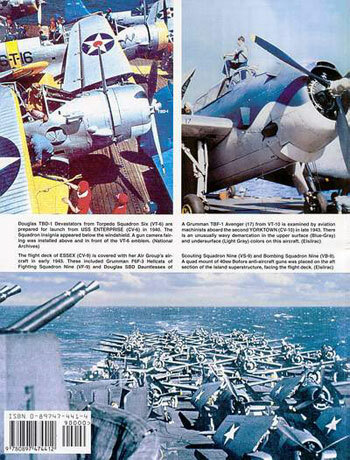 The title pretty well sums up the content of this new book from Squadron/Signal Publications, but perhaps it should have been sub-titled – “A Pictorial Record” for that is exactly what it is. The book consists of 64 glossy pages contained within cardboard covers. The front and rear covers carry full-colour wartime photos and the pages between them contain a whopping 141 black and white photographs as well as seven pages of full-colour side profiles. The commencement of each chapter provides a brief summary of the events and campaigns that occurred during the year as well as information on the colour schemes and markings borne by the aircraft involved. It is left to the sharp, clear photographs within the chapters and their captions to illustrate that information and illustrate it they do very well. 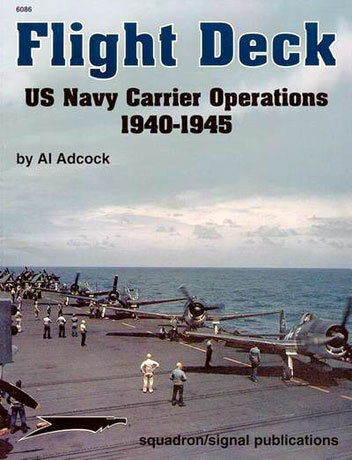 I have more than a decent collection of books dealing with US Naval aviation during WWII and I was hard pressed to recognize many of the photographs, the vast majority of them are new and have not been published before. This is a great book for the modeler. Lots of nice clear photographs that clearly show the things that you want to know before you load your airbrush. It shows you if you need to have a free-hand, a soft edged mask or a hard-masked demarcation between the colours. It also shows the many variations in the locations of the late-war geometric designs on glossy sea blue Hellcats, Corsairs, Avengers and Helldivers. Many of the photographs are of the aftermath of deck crashes and as such are nice and close revealing details of airframe stencil data and of the exhaust patterns on the fuselage sides and lower surfaces. Given the quality of presentation and the information contained within its covers, at this price you will be hard pressed to find a better source of reference.